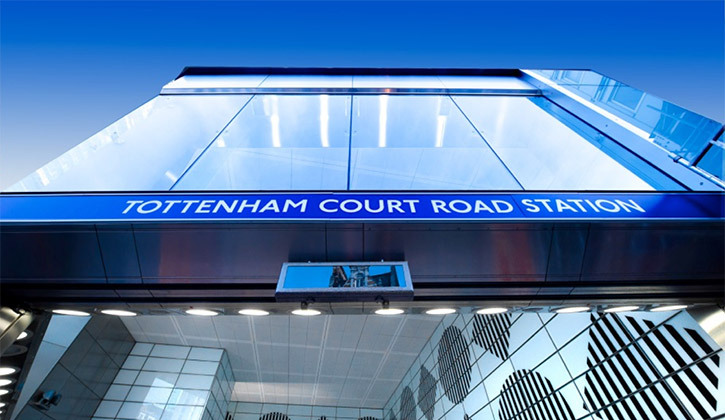 The new entrance to Tottenham Court Road Station is open and has been described as looking “pretty slick” by Time Out magazine. Forming phase one of Taylor Woodrow’s upgrade project, the new ticket hall was handed over to London Underground on Sunday 11th January and was immediately opened for use by the general public. It has a new and far larger entrance on the corner of Oxford Street and Charing Cross Road, with three new escalators leading to the spacious ticket hall and a further three new escalators leading from the ticket hall to the Northern line lower concourse. One of these is said to be the second longest escalator on the Underground (after Angel). The construction of the new ticket hall and the refurbishment of the passageways to the Northern line platforms have been underway since 2009, but represent only part of the overall project. By its completion in 2016, the station will be fully accessible with five new lifts providing step-free access from the ticket hall leading to the platforms. Around 150,000 people currently use the station daily, but this is expected to rise to over 200,000 when Crossrail services are open in 2018. The station will have eight new escalators, five new lifts, new Art on the Underground installations, two iconic glass plaza entrances, new CCTV cameras, better lighting and other improvements.